The "reboot" has been a fashion in Hollywood for the last decade or so, with many popular movie icons from James Bond to Batman going back to the drawing board and starting from scratch - not just with new actors but a new style and a new story. 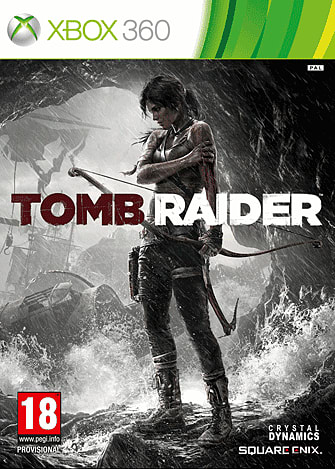 Now gaming's most famous heroine, Lara Croft, is set to follow suit in this brave and spectacular new Tomb Raider game. Sitting down to play the first three hours of the game recently, we already knew many of the facts. This Tomb Raider would present a young and vulnerable Lara in her first adventure, as she gradually learns the skills and strength that made her the backside-kicking adventurer we all know and love. It would be aimed squarely at a mature audience, with graphic violence and swearing and elements of horror. It would aim for a move involved storyline than the previous games. And, for the first time in the series' history, it would feature levelling and upgrades that allow you to develop and customise Lara's skills and tools as you play. You haven't been playing the game for long before all of these elements make their presence felt. Naturally, Lara's trademark athletic platforming is in there too, as well as plenty of combat. And yes, you do get to raid tombs for ancient artefacts. But the impression you get is of a game that's less concerned about living up to people's expectations of this much-loved series than it is about competing with the biggest blockbusters to follow in Lara's footsteps - especially Uncharted and Assassin's Creed. We pick things up at the start of the game, as Lara is shipwrecked on a mysterious island off the Japanese coast. Still a young student archaeologist, she's part of an expedition looking for the fabled island of Yamatai, which was supposedly ruled by a queen with shamanistic powers and an army of samurai. It soon becomes clear that they have indeed found Yamatai in the storm-tossed waters of the Bermuda-style "Dragon's Triangle" - but they've also found more than they bargained for. There are some scarily savage men on the island, as well as a ruthless gang of scavengers - and perhaps some more mysterious presences still. The group is split up and they lose radio contact with another, while Lara falls unconscious and then awakes hanging upside down and bound in a sort of cocoon amid the trappings of some weird cult. The set-up is very much like the hugely popular TV series Lost, then, although this island is a much gloomier place. Brilliant graphics, art direction and camera-work conjure up a moody, rain-lashed, rocky island dotted with ancient temples and dense forest; Tomb Raider is clearly a big-budget game that looks seriously impressive on the ageing Xbox 360 hardware. 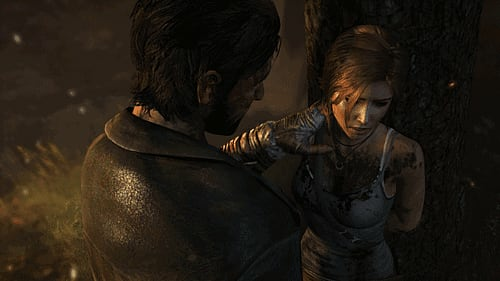 After escaping her strange prison and a sinister attacker, a wounded Lara attempts to get her bearings and regroup with her colleagues. The incredible animation really brings her physical struggle to life - certainly well enough that we don't really need all her slightly dodgy-sounding squeals and gasps. The gameplay that unfolds is everything you would expect from a modern action-adventure - maybe even more. It's a mixture of platforming (very much in the mould of previous Tomb Raiders, Prince of Persia, Uncharted and Assassin's Creed), exploration, stealth, shooting, hand-to-hand combat, physics-based puzzles, a little light survival-style gameplay, as well as that levelling and upgrading. 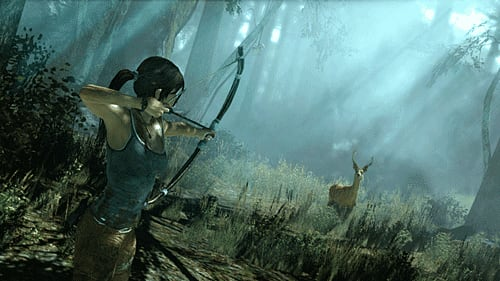 Exploring a forest glade, Lara finds a bow and arrow and hunts deer for food. Like most activities in the game, this earns her experience points which can be spent on new abilities, be they survival perks like being able to spot animal prey, new hand-to-hand combat moves, the ability to shoot a gun without recoil and so on. They're useful, but don't significantly change the feel of controlling the character. You can also collect "salvage" from animals and crates that lets you enhance the weapons you collect - we found a pistol, rifle and machine gun as well as the bow and arrow - and utility tools like the pry axe and climbing pick. The story moves along at a fair clip. Lara's soon reunited with some of her colleagues for dramatic events and cut-scenes, but when it comes to gameplay, she's always on her own, exploring the compact but densely detailed locations to find the way forward. If you're lucky, you might stumble across a secret challenge tomb that contains (in the example we found, anyway) a tricky puzzle and a big loot reward. These break up the forward momentum of the story a bit with some more classic, Tomb Raider-style gameplay, and as such they're very welcome. The rest, though - fittingly for this glitzy reboot - is pure Hollywood. To say too much would be to spoil the experience waiting when Tomb Raider is released in March 2013, but there's more than one daring escape, an encounter with the sinister leader of the scavenger gang, sections of stealth (for a vulnerable young woman, Lara can be pretty lethal up close) and running gun battles with the scavengers as well as some quieter moments of exploration. The climax of this first act, as Lara attempts to broadcast a distress signal from a radio mast on top of a snowy hilltop, is gripping and spectacular. It might not be the Tomb Raider you remember, then, but this is shaping up to be a memorable action-adventure that doesn't miss a beat when aiming for AAA gaming gold.